I saw this recipe sitting in my ‘folder of recipes that I will do someday’. Bet you have one of those folders too! There are a lot of good recipes in that folder. It was a nice, rainy Saturday with a tiny hint of autumn in the air. I made fresh tomato sauce last weekend with a enough left over to replace the can of tomatoes in this recipe. I also love olives and capers. Simple and Delicious! Melt butter in medium saucepan over medium low heat. Add onion, anchovies (or extra olives), pepper flakes, 1/2 teaspoon salt, and oregano and cook, stirring occasionally, until onion is golden brown, 3-5 minutes. Add garlic and cook until fragrant, about 30 seconds. Stir in tomatoes and sugar, increase heat to high and bring to simmer. Reduce heat to medium low and simmer until thickened slightly, about 10 minutes. Off heat, stir in olives, capers, and oil. Season with salt and pepper to taste, and serve over pasta. This is a quick recipe to do during the week. Mangiare bene! Found this recipe in a Food Network magazine. A simple and delicious weeknight recipe. Put the steak in a large resealable plastic bag. Add the juice of 1 lime, 1 tablespoon olive oil and the spice mixture, seal the bag and rub the spices into the meat. Refrigerate 30 minutes to 2 hours. While the steak is marinating chop the onions and peppers. Warm the tortillas as label instructs. Slice the steak against the grain, season with salt if desired. Serve on the tortillas with onions and peppers; top with cheese and cilantro (unless you are a cilantro hater!) Serve with lime wedges, if you wish. 1. 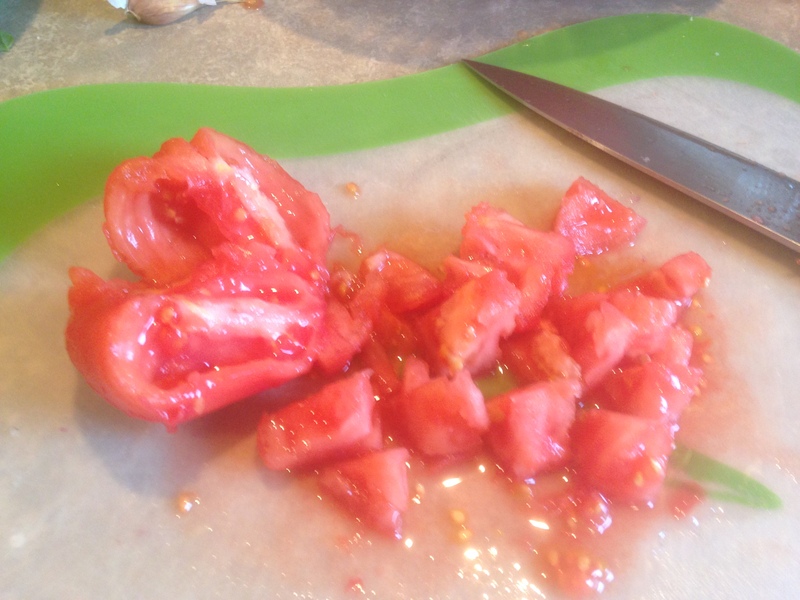 I prepare the fresh tomatoes by removing the skin and partially deseeding. 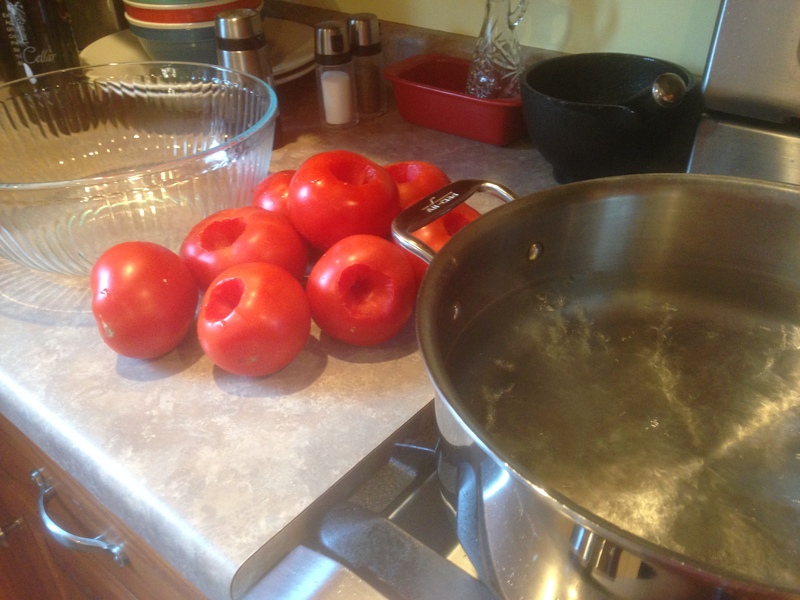 I remove the skin by coring the tomatoes and placing in boiling water for 60 seconds. Take them out of the pot and place in ice water to prevent the tomatoes from cooking. Remove the skin. Cut in half and take out seeds, if you want. I remove the seeds from half of the tomatoes. If you don’t want to de-seed that is fine too. 3. 2 Tablespoons of olive oil in medium saucepan over medium heat. Add the red/white onions and saute until softened, about 5 minutes. Then add the garlic and mix with the red onions about 30 seconds. 4. Add tomatoes and tomato paste to pan. Mix together. That is it! You will have some delicious sauce for dinner. You can also freeze what you don’t use. Sauce is my favorite meal. Hope you enjoy. 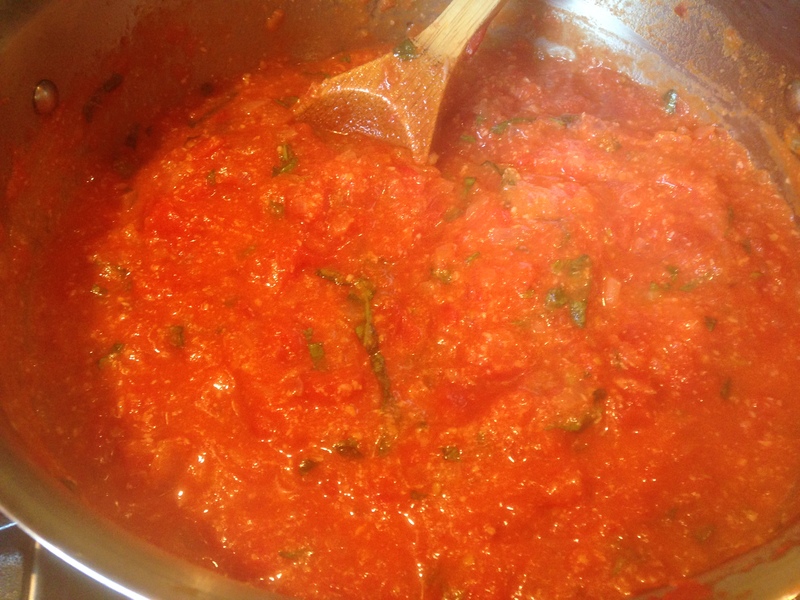 I have a couple of tomato sauce recipes on the blog. Fresh or made with cans of tomatoes. Whatever works for you! Found this recipe in a Food Network magazine. Super simple to make and delish. Give this one a try on a weekday. Heat 1 Tablespoon olive oil in a large pot or Dutch oven over medium high heat. Season the chicken with salt and pepper and add to the pot. Cook, stirring occasionally, until browned, about 8 minutes. Add curry powder and half of the garlic. Cook Stirring, until the garlic softens slightly, about 1 minute. Stir the chickpeas and their liquid into the pot and bring to a boil. Reduce the heat to medium low; cover and cook until the chicken is tender, about 12 minutes. Heat the remaining 2 Tablespoons olive oil in a small skillet over medium heat. Add the cilantro past; cook until dark green, about 1 minute. Transfer to a medium bowl and add the coleslaw mix; season with salt and toss to coat. Top each serving of the chicken curry with the slaw mixture, hot pepper sauce and cilantro. Serve with the naan. I LOVE all my Penzeys spices. I go there at least once a month to buy a new one to use or just to look around. Fun, fun, fun!! Saturday I attempted to go through a stack of Cook’s Illustrated and Cook’s Country magazines. Sadly, I have only gotten through halfway of one magazine. I kept finding recipes I wanted to make and it got me distracted from my task of getting rid of these magazines. This was one of the recipes I found and decided to try it for our dinner on Sunday. I made veggie stir fry to go with it. I also made Indian Tea Biscuits and Mekitsa. Once I get started I can’t control myself!! 1. Toss cabbage with salt in colander set over bowl or in sink and let stand until cabbage begins to wilt, about 20 minutes. Press cabbage gently with rubber spatula to squeeze out any excess moisture. (I just picked up and squeezed with my hand. Quite a bit of water dripped out.) Transfer to medium bowl. 2. Add pork, scallions, egg, soy sauce, ginger, garlic and pepper. Mix thoroughly to combine. 3. Cover with plastic wrap and refrigerate until mixture is cold. About 30 minutes or overnight if you like. 4. Ready to fill those dumplings?! Working with 4 wrappers at a time (keep remaining wrappers covered with moistened paper towel), place wrappers flat on counter. Spoon about 1-2 teaspoons of filling in middle of wrapper. Using a pastry brush or your finger moisten the edges of the wrapper. Fold each wrapper in half; starting with the center and working toward the outside edges, pinch edges together firmly to seal, pressing out any air pockets. 5. Transfer dumplings to baking sheet and repeat with remaining wrappers and filling. You will get at least 24 wrappers. 8. Uncover skillet, increase heat to medium high and continue to cook, without stirring, until dumpling bottoms are well browned and crisp, 3-4 minutes more. 9. Slide dumplings onto paper towel lined place, browned side facing down, and let drain briefly. 10. Transfer dumplings to platter and serve with dipping sauce. 11. Let skillet cool until warm, then wipe out with paper towels and repeat starting at step 6 with remaining dumplings, oil and water. Eric requested Po’Boys for dinner over the weekend. I had no idea what that was. The original Po’Boys are basically a seafood sub sandwich. You can also make hot sausage, chicken breast, roast beef and french fries too. The bread and remoulade sauce (check out my recipe) are an important piece to this sandwich. I got the rolls at Costco. They have great artisan bread there if you don’t feel like baking your own. I had fun making these. What was even better is everyone really enjoyed them! 1 1/2 pounds raw medium (about 40) shrimp peeled and deveined (I got these at Costco too. You could use large, also (about 20-25). Whisk first 8 ingredients in a small bowl. Use a heavy wide pot and add enough oil to measure 2″. Heat over medium heat to 350 degrees. You can use a deep fry thermometer if you have one. While oil is heating, place shrimp and spice mix in a medium bowl and toss to coat. Pour buttermilk into another medium bowl. Whisk flour and cornmeal in another bowl. Dip seasoned shrimp briefly in buttermilk, coat with flour mixture. Work in batches, fry shrimp, stirring occasionally, until golden brown and just cooked through. About 4 minutes per batch. Transfer on paper towels to drain. Open rolls and toast (or not – we toasted). Spread remoulade sauce on roll. Top with lettuce, tomato, pickles and shrimp. Serve with Louisiana Hot Sauce if desired.